In preparation of the next (4th) edition of my Groovy Cheminformatics book on cheminformatics with the CDK, I found a show stopper bug, fixed it, sent in the patch, and Rajarshi quickly reviewed and applied it to the cdk-1.4.x branch. This particularly bug was a null pointer exception that was fixed not so long ago in the log4j implementation, but turned out to be present in the logger to STDOUT too. This releases also fixes the reading of aliased atoms in MDL V2000 molfiles, thanx to another bug fix patch from John May (thanx! ), and formally deprecates the nonotify implementation, which has already been removed from the master branch. The silent module should be used instead, which has the same functionality but has cleaner code and faster. However, one important change you should take notice of, is an API change in the IIteratingChemObjectReader class. The change is minor, but useful. The interface is now typed, and implementing classes implement IIteratingChemObjectReader<IChemModel> (IteratingPCSubstancesXMLReader) or IIteratingChemObjectReader<IAtomContainer> (IteratingMDLReader, IteratingPCCompoundASNReader, IteratingPCCompoundXMLReader, IteratingSMILESReader). This means, that this iterator's next() method now returns an IChemModel or an IAtomContainer, and that casting in the using code is no longer needed. Release 1.4.6 of about a month ago, fixes a few bugs, including broken JavaDoc, atom type perception when SMILES are parsed while keeping the lower case formalism as aromaticity indicators (I will not discuss the pros and cons of that here), and the Chi index descriptors for sulphurs. This release also introduces a new fingerprint, based on an extensive list of biologically-relevant substructures identified by Klekota and Roth in 2008 (doi:10.1093/bioinformatics/btn479). This functionality was backported by Jonathan from the PaDeL software by Yap Chun Wei. The rest is a bunch of small code and dependency clean ups as well as new unit tests. I will use this page to post interesting stories around the CDK. It is not supposed to replace the Planet CDK, which aggregates blog posts from CDK developers and users, but for other, perhaps shorter posts. For example, as can be seen in the above screenshot, I have started to use it as a CDK Literature replacement, which originally was a series of articles in CDK News (the archives), and later hosted in my blog (see CDK Literature #5 for links to the other four). But, I will (re)share anything I find useful for the CDK community. Four years ago I wrote up a passionate post about the importance of ODOSOS, and about a year ago written about how research can be open sourced, and how the Open Source Chemistry Development Kit (CDK) fits in. I am proud that the CDK is enabling so many researchers to do novel research! Google Scholar reports over 200 documents and Web of Science gets to over 150 for just the first CDK paper (see also GS vs WoS). That's serious impact. We're far from being fully comparable with existing commercial tools, which have a 40 year head start. But with important functionality still missing (e.g. 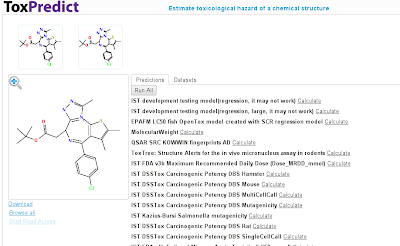 E/Z stereochemistry), and about 150 open bug reports which needs looking into, we surely can need funding and help! I can highly recommend watching it, as it is both very insightful about cancer (it's the third mechanism I know now how cells remember state, after DNA methylation, microRNAs, and now plain, boring protein; I wonder when metabolite-sized molecules show up as cell-division surviving state preservatives; they will). Now, the cancer the started of with, is pancreatic cancer, which is what my mother died of 3 years ago, which provides a third reason for me to love this video! Web of Science (WoS) is the de facto standard for citation information. It's citation counts are used for many purposes, among which to decide I am a good scientist. Web of Science, however, really expensive, and Joe the Plumber does not have access. No wonder, he doesn't know which scientist to trust (...). Recently, Google made their Scholar product open to all, allowing you to list your publications (about my list), which Google with augment with citation counts. If you search the web, you'll find much being said about the two, in particular compared with each other. One aspect is the accurateness of the citation counts, as people are afraid gaming, and random noise found on the web. Others would (counter)argue that Google captures a wider range of literature. I would be drooling if I got this kind of regression in my nanoQSAR studies! :) There is a very strong regression, indeed. One of the advantages of Google Scholar is does not select an elite group of journals (of course, they have to, because there data analysis process involves much more human curation), while Scholar captures newer Open Access journals, like the J. Cheminformatics, too. While I may be a bit of a non-typical scientist (some even argue I am not even doing science...), the overall outcome is that Google Scholar is actually more accurate about my impact than Web of Science is right now. 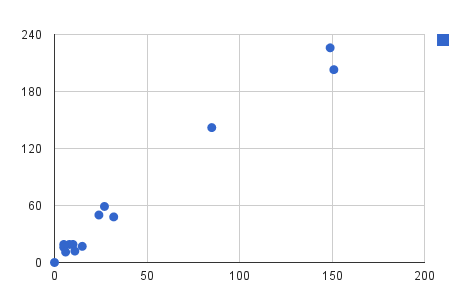 What data is behind this scatter plot? Peter has started a new line of discussion in his blog, referring to a correspondence with representatives from RSC last year, about an annotated literature corpus to (re)train the Oscar3/4 text miner. There are very many sides, and after I reread this post for a second time, I was still not 100% happy about all words: I can only try to express the complexity of the matter and how it started, but do hope to be clear that non-commercial licenses are not useful in Open Science. I have taken part in parts of the correspondence Peter refers to, and I would not have written up things as Peter wrote up his impression of the outcome of that discussion, and at some point I seem to no longer have been included in the email correspondence, as I at least did not know the final outcome (see below), and cannot fully comment on the accuracy of Peter's coverage of that correspondence, but my impression on the outcome, as limited as it was, is not that far away from what Peter wrote up: Oscar4 needs training (doi:10.1186/1758-2946-3-41), and the RSC was unwilling to contribute the full text training corpus to the project without a non-commercial (NC) clause (and I explain below why I think this is bad). Oscar without a training corpus is useless; Oscar with a NC-licences training course is not Open Source (see below). As detailed below, the corpus at sentence level is NC-free licensed, and a lot of training can be done that way. Sufficient? "I pointed out very clearly that CC-NC would mean we couldn’t redistribute the corpus as a training resource (and that this was essential since others would wish to recalibrate OSCAR). Yes, they understood the implications. No they wouldn’t change. They realised the problems it would cause downstream. So we cannot redistribute the corpus with OSCAR3. The science of textmining suffers again." I do not know if it is factually correct that the RSC would not change (below we read they attempted), or whether the organisation really understood the problems. But, it certainly is a fact that we cannot redistribute Oscar4 as an Open Science project with a NC-licensed clause. And, I want to add and stress here, that blog posts sometimes are just like press releases: things have the highest impact if written down in a black-and-white fashion; and getting things factually wrong happens to all of us now and then. One of the outcomes I learned about this week, is that the RSC released the corpus in some form without the NC-clause. The full text paper corpus remained the NC clause of the CC license, but there is also a version where all sentences are released, and this has a CC license without the NC clause. I think this is not optimal, but still very much appreciate the gesture the RSC is making here, and would to kindly thank them for that! And do I want to make that clear too (thanx to Cameron for phrasing it so well in his comment), it is the principle freedom for the RSC to decide what they want to do, and I fully respect that. Well, with that out of the way, and I wanted to say something about it, having been involved in the discussion, and feeling a bit in between Peter and the RSC here, appreciating both their view points, and having a third one myself, let's focus on this non-commercial clause a bit more. Of we enlarge our scope a bit, away from written material, to Open Science, it is clear that the non-commercial clause is bad. In the Open Source world, organisations like the Debian project clearly state that non-commercial clauses violate basic freedoms. From an Open Standard point of perspective, this is pretty much the same. The reason, whether you like it or not, we live in a commercial world. Society expects us to me commercial, and any serious business is legally required to make making profit a company goal. Now, this effectively means that any science made available as non-commercial is not Open: you are effectively not giving people the freedom they need to advance science. In short, a CC license with the NC clause is in fact quite like "yes, we love to be Open, but we are too scared". Now really, I understand this scare. I am a scientist, post-hopping around Europe, not tenured, and not being an experimental scientist, unlikely to become one. Don't tell me about risk and scare of making things Open. Yet, I did, and it payed of (not enough yet; still looking for a fixed academic position, as I already indicated). But in the more than 15 years I have been working now in Open Science, I have yet to find a compelling (or any) argument to back up this fear: the perceived risk of the NC clause has so far not proved any different than a fear of ghosts. On the other hand, if I would not have been involved in Open Science, I would not have worked for the top European institutes I have been working in the past ten years. So, what are the arguments for using the NC clause? The fear I understand, but arguments I do not see that support that a NC clause is useful in an Open Science setting. Next in this series (after #1, #2, #3, #4, #5, #6, #7, #8), I'll show how to add implicit hydrogens to a drawing. I actually think the BasicAtomGenerator should cover implicit hydrogens, and the ExtendedAtomGenerator anything that requires more CDK modules than just the interfaces, like isotopes. But I discovered that implicit hydrogens currently also requires the ExtendedAtomContainer too late. In fact, there are other things I like to see changed, but I do not have the resources for that right now. So, you will need the CDK-JChemPaint jar (which is not the JChemPaint code!). But alas, there are always things to fix. I'm personally not aesthetically pleased with the kerning of just CH4 either. The following two code snippets are part of full scripts available from my Groovy-JChemPaint repository, and these two drawings are created with CDK 1.4.6. That's it. Here's the full script. Every now and then I people who show interested on working on the CDK. I reply to them what is involved, and I rarely here back from them. I know this is common for most open source projects (see also Community development), and for the CDK this is likely caused the cumbersome process of getting a full development environment set up. Over the next months, I will make an effort to extend my Groovy Cheminformatics book to include detail after detail on how to do this. But what would also be welcome is a VM (OVF) image that has everything set up and well. Anyway, but the road to CDK commit fame does nowadays not require a full-fledged development environment. Instead, we have GitHub. Their web interfaces makes a lot of things easy, including source code peer review. 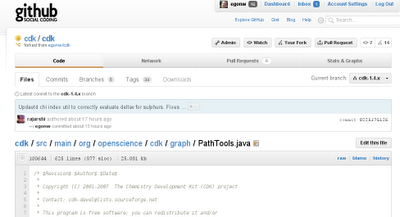 But in this post I would like to show how easy it is to fix small things in the CDK, by using the GitHub GUI. Of course, this post can be used for any project hosted on GitHub. JavaDoc has a special purpose with the first sentence in any JavaDoc: it serves as a summary. The detect the first sentence, it must properly end with a period. That patch cannot get any easier. It just requires a missing period to be added. I already scrolled down a bit, to the line with the missing period from this example. Make the modification, and scroll down to the lower part of the page, and read step 5. If you have multiple JavaDoc fixes, put them in one commit. But, preferably do not mix them with other fixes, as to keep the commit message as well as the peer-review simple. That speeds up the reviewing process, and makes it easier for me and Rajarshi to apply to the main source tree, but more about that in the next steps. Of course, this online editing can also be used for fixing PMD warnings, as reported by this Nightly report. However, keep in mind that you cannot recompile the code this way, and for code changes, this online approach is discouraged. When done, press 'Propose File Change' (Rajarshi and I see a 'Commit Changes' button instead). After a new page is opened, the commit has been created, and it is time to inform us of your commit. 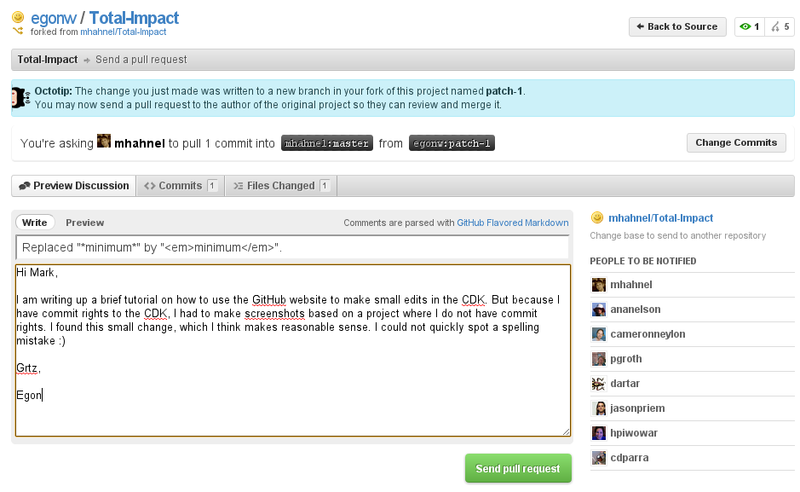 This is done via a so-called 'pull request', as outlined in the next step. 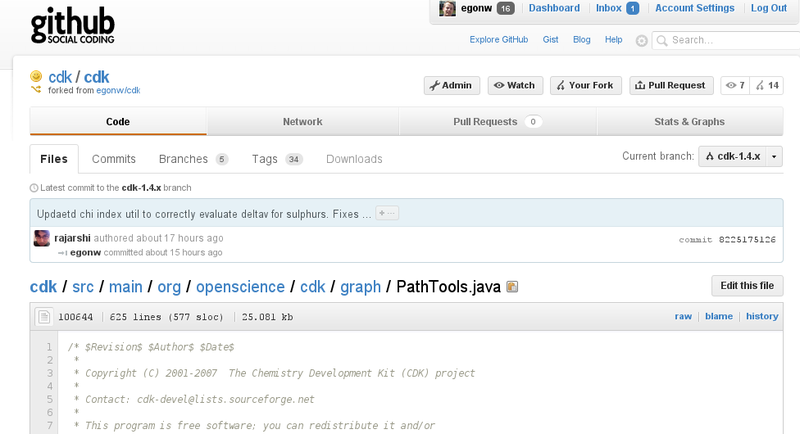 So, while for another GitHub project (Total-Impact is worth checking out), this page should look similar. The top grey bar show the project name and the 'Send a pull request', confirming that this page does what we are expecting. In the blue box a comment is given on where your commit is stored, which is in your own fork of the CDK for your own GitHub account, in a branch called patch-x. Below that blue box, reference is made to your newly-made commit, and a bit further below two text fields, a single line text box for a message 'subject' prefilled with the commit message, and a text box where you can leave a message to accompany the pull request. This message is used to put the pull request in perspective, and can be used to introduce yourself briefly, refer to a set of patches, or whatever. This message will not end up in the git repository. The more requests you make, the smaller this message will get. "Yeah, another JavaDoc fix." Hit the green 'Send pull request' button, and you're done. Storing in the ToxBank data warehouse and sharing it among SEURAT-1 is not the only goal of a omics data integration effort. Combing omics data sets available from the data warehouse will provide knowledge not visible from a single data set. The ToxBank platform aims at making these kinds of omics analysis possible. We invited Prof. Roland Grafström to present the omics data analysis work in cancer genomics for a seminar to speak on their recent work in the field. Prof. Grafström is partner in the ToxBank project and is associated with the Karolinska Institutet medical university in Sweden, and the governmental research institute VTT in Finland. The presentation will highlight the interpretation of gene expression data from the application of a combination of bioinformatics tools, including the Ingenuity Pathway Analysis software and the Gene Ontology. Basic concepts and terminologies will be dealt with including for integration of omics data, in vitro to in vivo extrapolations, as well as retrieval and validation of biomarker genes in large data sets. Work aimed at tumor biomarker discovery in head and neck cancer will be presented, but the results will discussed in the context of the work planned in the SEURAT cluster. The meeting will be held online and will be organized via GoToMeeting. There are only 25 seats, so registration is important, as we will fill seats on a first-come basis. However, one ‘seat’ can host multiple scientists behind a single computer, if needed. Please send an email to Egon Willighagen (egon.willighagen@ki.se) listing your name, SEURAT-1 project, and email address. Details on how to log in will be send to that address shortly before the meeting. Some two months ago we decided to go back to the Netherlands, after having lived for more than three years here in Sweden. We have had a great time in our three houses, but feel a need to settle down, closer to family. A week later I was contacted by Chris Evelo contacted me for a position to work on Open PHACTS. Chris and I only met for the first time in March, when I visited the group when I had a conference in Maastricht. His bioinformatics group is very much into Open Science and with a good track record in metabolism and transcriptomics analyses (something we do here at KI too), and Open PHACTS is an interesting EU project into the application of semantic web technologies to the life sciences, something I have worked a lot on in the past two years. And, of course, I got a bit of funding rewarded here at KI, that I will use next year for two or three visits back to Stockholm, because there is some low-hanging fruit that remains to be picked. CDK 1.4.5 just got uploaded to SourceForge, about a month after the 1.4.4, though mere minutes after the 1.4.4 release notes. CDK 1.4.5 is the fifth bug fix release of the 1.4 series and brings another few bug fixes. The changes include fixes to the JavaDoc generation, now outputting proper citations of PhD thesis and books, a fix in the SDFWriter to inherit the IO options from the underlying (used) MDLV2000Writer, restored atom type perception in SMILES parsing if aromaticity is not actively perceived (in line with earlier 1.4.x behavior that unfortunately got broken due to another fix), a fix in the MDLV2000Reader to deal with pseudo atoms with numbers greater than 9 (thanx to John May! ), a fix in the sorting of IAtomContainers, and a fix for the elusive bug in the AWTRenderer causing thin bonds (e.g. due to zooming) to become grey. CDK 1.4.5 just got uploaded to SourceForge, and when I looked up the link to the notes for 1.4.4 I noted I had not released those notes yet. So, here are those first. CDK 1.4.4 is the fourth bug fix release of the 1.4 series and brings another few bug fixes. The changes include new cobalt atom types, a fix to ensure that all molecular descriptors are properly recognized by the build system, and a fix for the Log4J-based LoggingTool, to properly handle nulls. So, not so many changes, which probably explains why I forgot to blog about it earlier. I'll see what I can do about that, but the API might evolve a bit anyway. That leaves me to mention that Bioclipse has an Oscar extension (Bioclipse has a lot of functionality nowadays, in fact), and that I blogged several times on Oscar4 when I was working with the other authors on the refactoring last year. "Post-doc with experience in CDK programming wanted"
SMARTCyp (see papers below) is an integrated computational approach that mixes cheminformatics with molecular modeling approaches to predict the metabolic fate of molecules. This fate is important to various biological aspects of small molecules, and the metabolism can active a prodrug into a drug, make a toxic compound non-toxic, and a non-toxic compound risky. The tool has been well received by the community, complementing other approaches. Now, the reason why I blog about these papers now, is that the tool uses the CDK for the cheminformatics parts, which I find really cool. In fact, the project has resulted in good feedback on the CDK. In fact, the project received further funding creating a short-term open position to continue research on enzymatic reactivity of molecules in the cytochrome P450 family, as outlined below. So, this peer-review is a bit more on the impact of the CDK and SMARTCyp on the academic landscape, than on the content.of the paper. I'm seeking candidates for a post-doc position in applied cheminformatics at the University of Copenhagen. We are working on drug metabolism prediction models, and our results are as far as possible made into open source software based on the CDK. The group has previously developed the SMARTCyp site-of-metabolism prediction software which is based on CDK, and this project aims to extend the scope of our cytochrome P450 project. Bonus for experience in java programming using the Chemistry Development Kit (CDK), experience in development of ligand based virtual screening methods, and experience of work on the cytochrome P450 enzyme family. The SMARTCyp paper can be found linked to below, with the details of how the CDK and SMARTCyp interoperate and make P450 predictions. I reported earlier how to I uploaded the ChemPedia (RIP) data onto Kasabi. But for ChEMBL-RDF I have used the pytassium tool, not just because it has a cool name :) I discovered yesterday, however, that I did not write down in this lab notebook, what steps I needed to take to reproduce it. And I just wanted to uploaded new triples to the ChEMBL-RDF data set on Kasabi. So, that omission in my log book has been corrected now. 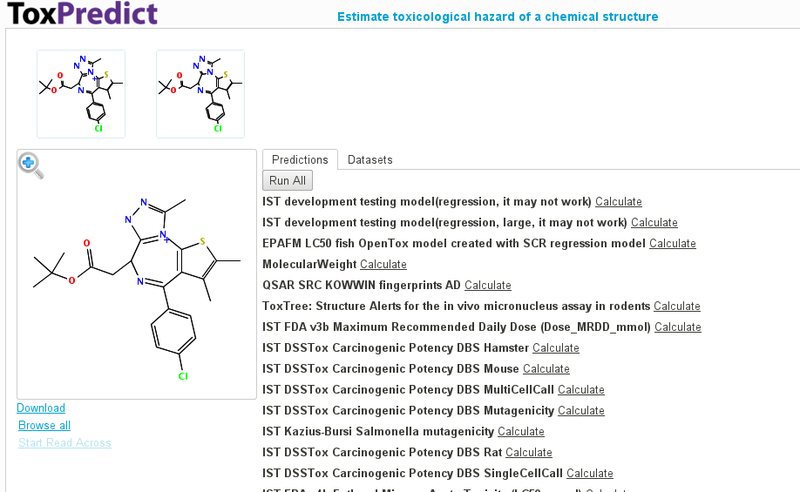 I just had a conference call on one of the translational cheminformatics projects I am involved in: Bioclipse-OpenTox. A paper about this project has been submitted, and we are writing up a more practice oriented book chapter (almost done). In writing up a use case, we ran into a recurrent problem: proper cheminformatics handling of input files. Ola suggested to start writing more extensive documentation on what users of the CDK are supposed to do when reading a file. So, here I start a new series. These principles have a profound effect on the usability of the CDK. And here I must stress the point I made recently on usability: what happens if you neglect less abundant personas. Well, in this case, the abundancy is actually somewhat different. But, CDK libraries target a few personas: one of these is the scientist that uses cheminformatics as a mere tool, who doesn't know graph theory, let alone file formats; this personas works in the field of translational cheminformatics. Let's call him Tony. 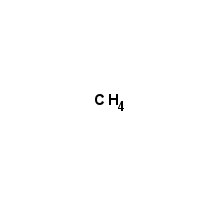 The other personas has a more extensive education in cheminformatics (e.g. former Gasteiger lab, Sheffield, former CAOS/CAMM (like me), etc) or are actively involved in cheminformatics research (like that of Christoph, and many, many more). This personas we will call Carry. The CDK, with its limited resources, must target both Tony as well as Carry; both have widely different needs, and somewhere, in our free hours, we must work on solutions for both personas. Carry and Tony are, of course, exaggerations, and all readers (and me too) are linear combinations of these personas. In fact, you can even be a Carry in some parts of the CDK, while being a Tony in others. The CDK has so much functionality nowadays, that even I have unexplored corners. And, practically, the building block approach is important to Carry (she might want to plug in her own aromaticity model), but a killer for Tony. A prominent, recurrent problem for the first personas, is to deal with missing information. And input files have missing information. Some formats are more explicit than others. This series will focus on these aspects, and discuss how the CDK can be used to add that missing information. Another important aspect is that the CDK data model cannot hold all information. For example, I have no clue how the CDK should read MDL files with a muonium (browse the cdk-devel mailing list archives of this month). Here too, this is not always clear to Tony, who does not have the time to read file format specifications, nor CDK interfaces. He just wants the CDK to do its thing which it is supposed to be good at. So, here we are. We have a MDL .mol file. They are pretty much the community standard, and even pretty Open too. You can now find the specs in the ctfile.pdf, readily available on the web. Actually, they are no longer called MDL formats, but Symyx formats, umm, Accelrys formats. These formats define a number of file formats, including the aforementioned Accelrys molfile, the Symyx SD file, but also query formats, used to store queries against their database software. Like any file format, they support a number of features. For example, MDL files cannot represent a bond order 4, a quadruple bond. Organic chemistry doesn't need them. Moreover, hydrogens are often implicit, as they can easily be added later, and both memory and disk space is expensive (think 80-ies). 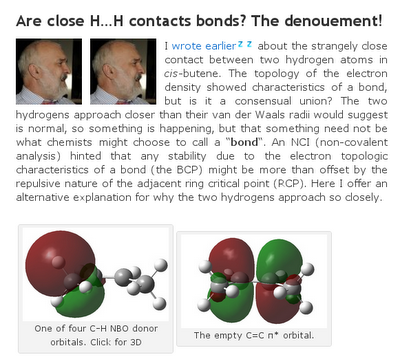 Stereochemistry is wedge-bond-based and others. Well, more recent MDL formats have become more powerful. The V3000 format can do much more then the V2000 format, or even the pre-V2000 format. Now, the trigger for the start of this series is the bond order 4 in MDL files. Strictly speaking this is not part of the molfile format, nor of the SD file format; instead, it's part of the query format. However, the community ignored that part of the specification, and the molfiles and SD files are commonly using this query type to represent aromatic bonds. Well, or bonds that can be both single or double. Now, the CDK does not have a structure to represent a single OR a double bond order. The CDK only has SINGLE, DOUBLE, TRIPLE, and QUADRUPLE (see IBond.Order). Moreover, it has a separate mechanism to indicate if a bond is aromatic. A flag is used for that. This allows the CDK to store both kekule-ized bond order localization and aromaticity perception information separately. So, if a MDL molfile (or SD file) is read with the CDK in RELAXED mode with the MDLV2000Reader, order 4 bonds are read as SINGLE bonds with a flag indicating it is aromatic. If only the CDK had IBond.Order.UNKNOWN. This is scheduled for master. Mind you, this is a complicated patch, because a lot of algorithm introspect the bond order information, which will have to be updated to handle UNKNOWN bond orders. This is a nasty co-incidence (interaction effect) killing Tony's use case: the MDL molfiles in the wild have information that the CDK cannot represent, sadly. Now, if users would have been paying for CDK releases, we could have assigned a developer on it. We have the mechanisms in place to buy a copy of the CDK, so that's not really an excuse (price negotiable; maybe 4999 SEK, but you are welcome to buy a campus-wide CDK version for more). If enough people / companies would do this, we could hire a developer to implement this particular use case. This would be a great way to support the project! Carry would know this. In fact, Carry would probably have some comments on this recipe. Well, Carry can leave those in the comments of this post. 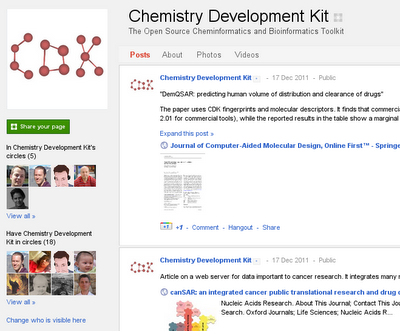 It shows a number of Open Standards (diamonds), one Open Data set (rectangles), and Open Source projects (ovals). What does diagram is not showing, is the huge amount of further Open Source cheminformatics projects around, that use one or more of the components listed here, but which do not link themselves to the Blue Obelisk directly. And there are many indeed, both proprietary and Open. I am proud of this diagram: it really shows that the interoperability we set out in the first paper worked out very well! This makes the Blue Obelisk an excellent set of shoulders to do translational cheminformatics. Translational cheminformatics?? Well, I have been looking for a while for a good term for my research regarding all that hacking on the CDK, Bioclipse, etc. Now, that's the translation of my core molecular chemometrics research to other scientific fields, like metabolomics, toxicology, etc. I learned a second trick today (see also this first); this one is about the Semantic MediaWiki (SMW). I was using a trick I learned from RDFIO before, setting Equivalent and Original URIs (though the difference between those, I lost). But I ran into the problem that these equivalent URIs cannot contain hashes (#), or not always it seems. After some googling, I did not find an answer, and turned to the SMW IRC channel. Saruman was helping out and pointed me to the Equivalant URI wiki page. I had looked at that earlier, but now turned to the Import vocabulary page. While this was not what Saruman wanted me to look at, it did turn out a nice workaround. The wiki page shows how to import external ontologies. This trick requires you to craft a wiki page with a special name, starting with MediaWiki:Smw_import_ followed by a namespace. It exemplifies this with the FOAF ontology, which is in fact an ontology I was also using equivalent URIs for. Then, in a Property page, which I want to make equivalent with a property in FOAF or RDF Schema, I can now simply use [[imported from::foaf:homepage]] or [[imported from::rdfs:seeAlso]], in Property:Has_homepage and Property:See_also respectively. That's a neat trick, /me thinks! His double gravatar is not vanity, but a bug in one of blog extensions he is using creating those blue z icons. I think the French in the blog title is, while unlikely for British I always understood, deliberate. Henry, if you're reading this... what about adding permalinks to those Jmol visualizations (or DOIs, like data cites)? Second, I'd love to be able to download to be able to download a visualization, and open it in Jmol or Bioclipse. Would such be possible in CML or JVXL (think datument)? The market is seriously changing now. Another year, and Microsoft Windows is no longer the majority OS. Of course, my blog is very specific, and these statistics do not map well to global market shares. I had these two blog posts open in my browser since about the time they were blogged, intending to reply. But I could not come up with a good answer, despite I was hoping to do so. For RDF-based data there are a few options now, such as Kasabi and Science 3.0. Also, for crystallography data there is the Crystallography Open Database, and for quantum chemical calculations there is Quixote. And, of course, annotated NMR spectra can go into the NMRShiftDB. But for chemistry data in general I do not know a solution. What to do with JDX files, with images of chromatograms? BioTorrents perhaps? But that is mostly for large data sets, and does not have a clear indexing approach. ChemSpider, as Jean-Claude has been doing for spectra (see this YouTube video)? 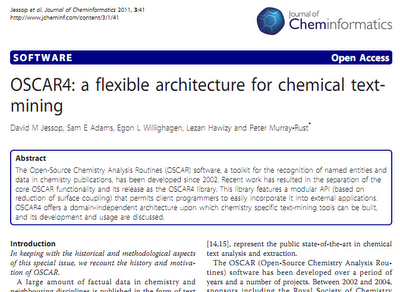 ChemSpider does not have a solution to extracting the Open Data. So, hereby this call for help: let's categorize what repositories are around that fulfill the 6 required features (or come very close). We can start of using regular blogging practices, by blogging solutions, ideas, comments, etc in reply, or use the commenting facilities here. Any activity in this area is appreciated and most welcomed by the community. QSAR and QSPR are the fields that statistically correlate chemical substance features with (biological) activities (QSAR) or properties (QSPR). The chemical substance can be molecular structures, drug (which are not uncommonly mixtures), and true mixture like nanomaterials (NanoQSAR). Readers of this blog know I have been working towards making these kind of studies more reproducible for many years now. Parts of this full story include the Blue Obelisk Data Repository (BODR), QSAR-ML, the CDK for descriptor calculation, the Blue Obelisk Descriptor Ontology (BODO, doi:), still used by the CDK, and in the past by JOELib too, and much, much more. Really, I still feel that the statistics is by far the easiest bit in QSAR modeling. 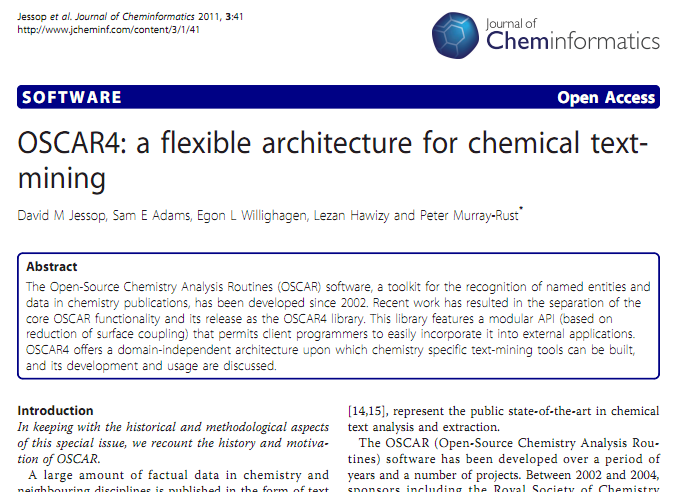 New in this list of tools to make QSAR more reproducible, is the CHEMINF ontology, which further formalizes cheminformatics computation. In a collaboration with Janna and Christoph (EBI), Michel and Leonid (Carlton University), and Nico (formerly at Cambridge, now at CSIRO), we have cooked up an ontology, and the computational bits of it are captured by the below figure from the paper that just appeared in PLoS ONE. Both the paper and the ontology have a Creative Commons license. The ontology has already been used by Leonid in other papers, and I have been using it already in the RDF-ed version of ChEMBL. Next steps for me regarding this ontology is to convert to BODO to be based on CHEMINF, but highly interesting too is a reformulation of QSAR-ML to be based on CHEMINF. The QSAR markup language was long started before RDF came into the picture, so please forgive us for now using RDF from the start there. One particularly interesting aspect this ontology captures is the difference between molecular entities and mixtures. Not uncommonly, QSAR studies correlate drugs to their binding affinities, even if those drugs are in fact mixtures of stereoisomers. While 0D, 1D, and 2D descriptors are not affected, geometrical descriptors most certainly are. Moveover, the modeled endpoint is very possibly the property of only one of the stereoisomers, most certainly for binding affinities. Yet, many QSAR study reports in literature do not record such details. 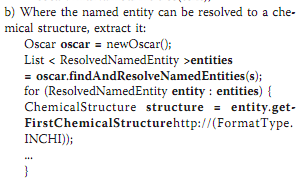 The CHEMINF ontology defines the terms you need to publish such details. A recurrent question for the CDK project is the about the AtomContainerManipulator.getNaturalExactMass() and why it return NaN for some elements. There are various incarnations of the issues here, but the key here is the difference between the various weights a molecule can have. The weight of a single molecule is well-defined, but requires you to know which isotopes are present in the molecule, which you typically do not. Each isotope of an element has a natural abundance. For example, carbon isotopes found on earth are mostly 12C, and a bit of 13C. In fact, 12C is about 99 times more abundant than 13C. The same goes for 1H and 2H: the first is way more abundant than the latter. This means that the molecular weight of a single methane molecule can only be calculated which isotopes are present in the molecule. But, the most occurring combination, is the molecule with just the major isotopes, SMILES: [1H][12C]([1H])([1H])[1H]. A few elements have two isotopes which are almost equally abundant, such as bromine. However, in experimental chemistry we are not looking at individual molecules (well, we can nowadays), but typically at substances of those molecules. Substances contains very many single molecules (remember the Avogadro's constant). So, we have a mixture of molecules with different isotope ratios. As indicated earlier, the majority of those molecules contain only major isotopes, but as a substance we rather just take the natural mass of the molecular, which is an average weight for that element (called atomic weights), giving the natural abundances of the element's isotopes. Mind you, these atomic weights are not constant, as recently made the news. Only isotopic weights are constant, the atomic weights depend on the ratio of isotopes, which varies around the world. But, returning to AtomContainerManipulator.getNaturalExactMass() method, it should be noted that atomic weights are also only defined for elements which in fact are found on earth; elements which are naturally found, and for which the isotopic abundances can be calculated. Thus, atomic weights are not defined for synthetic elements, which we have more and more. So, if you call this getNaturalExactMass() method for a molecular structures which has one or more elements with that do not occur naturally, you will get an NaN answer. In fact, I guess the method should throw a CDKException with a message like "Hey dude, you have non-natural elements in this molecule!". Technetium (Tc) is such an element which does not have any naturally occurring isotopes, so the CDK cannot calculate a atomic weight. And that is the answer to this bug report.